The friction between the tube and the tools at the point of bend. Drag has the undesirable effect of retarding the free flow of the tubing material as it drawn forward around the bend die and so becomes plastic at the point of bend. This retardation of the flow exacerbates the inherent compression of the intrados and elongation of the extrados, and so must be minimized. 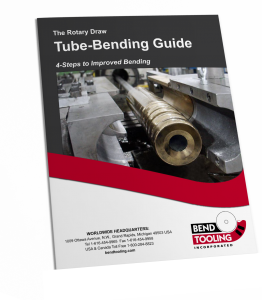 Drag, however, is also inherent to the rotary-draw bending process and cannot be completely eliminated, but low direct pressure and a forward mandrel setting do keep drag to a minimum.